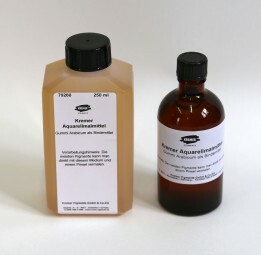 Kremer Watercolor Medium | Mediums & Natural Gums | Water-soluble Binders | Mediums, Binders & Glues | Kremer Pigments Inc. Recipe: Combine several drops of this medium and some distilled water with 1 - 3 tsp. of dry pigment. Add a few drops of ox gall for flow. Mull into a smooth paste and fill into pans. Let the pans harden overnight. The easiest pigments to mix are mineral based colors. WARNING: Wash hands immediately after use. When using do not eat, drink or smoke. Use only with adequate ventilation. Customer evaluation for "Kremer Watercolor Medium"